Warmoth Headstock Decal - Use Them? Discussion in 'Guitars in General' started by scottrolf, Feb 27, 2015. Love blank headstocks, so none of my Warmoth necks sport the logo. I think this works better for them though, because a ton of people ask what kind of guitar I'm playing and I tell them all about Warmoth. I too had some custom decals made for mine. I would never stick a Warmoth sticker on my headstock. make your own with water slide decals, windows, and a printer. Does anyone know the actual name of the Script font for the Fender logo or is it a style that Fender themselves made up? I think I googled "Fender font" until I found the one above on some free font site. When I'm at my computer I'll see if I can find out what it's called. I've built many Warmoth guitars, probably 10 over the years, and I've never put a decal on. I like the blank headstock look. When I worked with Big Mike, he had the idea to do a NOYBcaster..."None of yo business"caster! Four Warmoth guitars so far, five necks though. I don't mind blank headstocks, especially with dark woods like RW, Wenge etc. Even maple when it has interesting grain patterns looks good. Exception is a maple CBS headstock, it's just too much without something. I see no reason putting anyone else's name in my guitar, this goes for Fender too. The metal decals were nice though and I would love to make my own versions. Rothko and Frost (English company) made them and they did a great job. According to the guy who finished the neck and put them on there are the thinnest decals he has worked. I don't care for blank headstocks and don't like the idea of putting the Fender logo on something that's not a Fender (licensed or not) so I go with the neck manufacturer's logo. That looks really cool. My 40th is a few years away, guess its time to start working on the wife. I prefer the look of a headstock wothout a logo, although I do like sone of the custom logos in this thread. 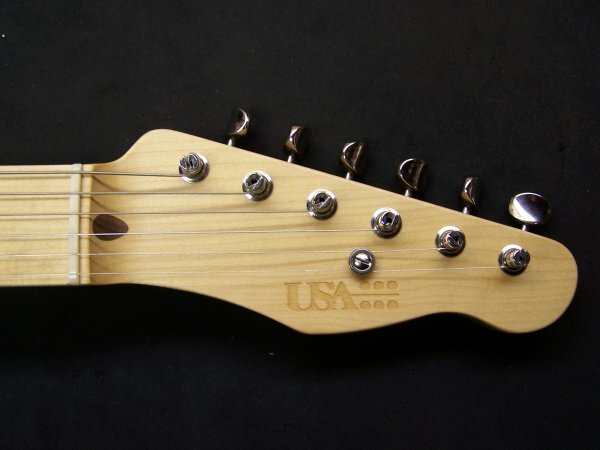 I think its silly that it costs extra to have USA Custom Guitars put their logo on their necks. It doesn't seem right to me to put a Fender logo on a neck they didnt make. J Bennett did this one for me. I love the folks at USA Custom Guitars. But... I prefer a certain style of decal, so, I'd prefer a different decal on this Floyd equipped F style guitar of mine. I'm not going to screw with it though. Can anyone recommend a good decal paper stock for my inkjet printer? I see some online but don't know first hand how they take to headstocks. I dug around a little and turns out I used Papilio Clear Inkjet Decal Paper, bought from Amazon. Don't remember why I chose it, but I'm sure it was based on some sort of research. I printed a full page. There were issues with a lot of them due to errant ink from my printer. I used those for practice. My Warmoth neck has their satin nitro on it, and the decal took to it just fine. I sprayed a zillion coats of gloss rattle can nitro over the headstock face and it looks good to me. There's a very slight outline around the decal. I want to say there was some way to prevent that, but can't remember. My Warmoth headstocks are all naked. I slightly prefer a decal vs blank, but the thought of putting Fender on a non Fender reeks of insecurity. 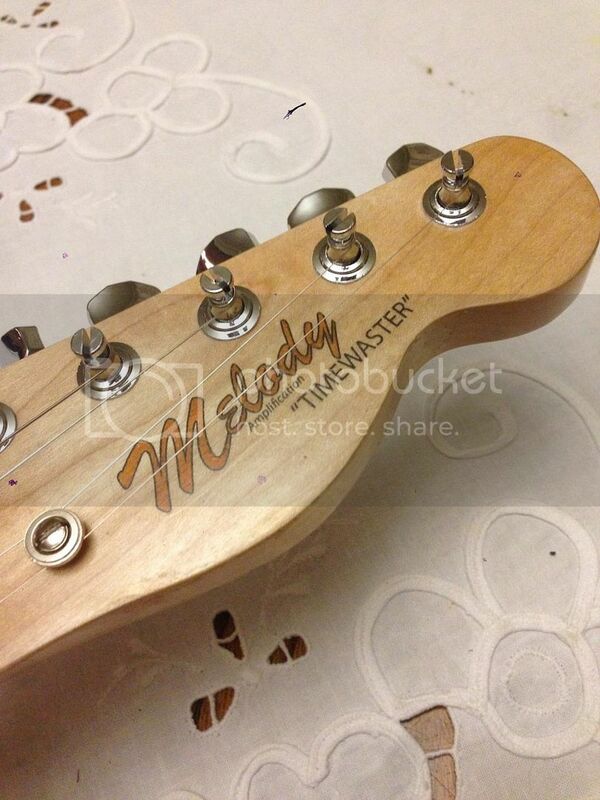 A custom decal is what will happen next time I'm adorning a headstock.